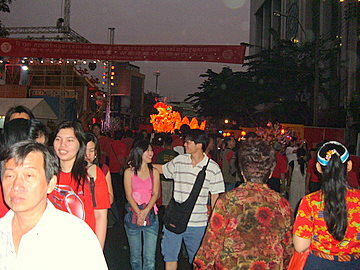 Chinese New Year in Bangkok 2006 opened on 29 January with a splash of red as Yaowarat ushers in the Year of the Dog. Yaowarat Road, the main street in Chinatown, closed for a 2-day street festival with Chinese lanterns, dancers, lions and dragons and a royal visit by the Crown Princess. 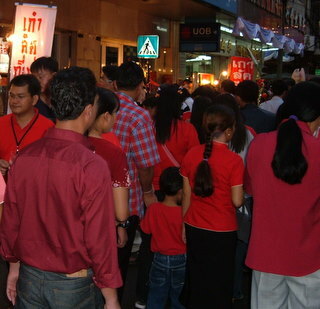 From Hua Lam Pong subway station, streams of people in red, the lucky color, converge on Yaowarat, Chinatown, to celebrate Chinese New Year in Bangkok 2006. This grand occasion also commemorates the 60th year of the reign of King Bhumipol Adulyadej. At Wat Traimit, the famous Temple of the Golden Buddha, heavy fumes of joss sticks hang in the air. Hundreds of worshippers pray to Chinese deities placed in the courtyard for the occasion. In a separate building, there's a long queue to pray at the 5 m high Buddha made from 5 tons of gold. The Odeon Circle, entrance to Chinatown, is decked with tall Chinese lanterns from Foshan. Officials wait for the arrival of HRH Crown Princess Maha Chakri Sirindhorn under Chalerm Phrakiat Gate, the tall arched gate built in 1999 to honor the 72nd birthday of His Majesty King Bhumipol Adulyadej. There's an air of anticipation in the crowd. A wave of excitement grips them when the royal entourage arrives at 1645 hours. In a surge of emotion, royal and national pendants flutter as people call out to greet the Crown Princess. Lantern dancers from Xian, China in dazzling red dresses, welcome the royal guest of honor. As part of the royal visit, the Crown Princess walks down Yaowarat Road to visit shops and two old temples in Chinatown. We wait with people packed shoulder to shoulder behind security barriers. She passes by and we catch a glimpse. The street vendors and restaurants in Yaowarat Road do a roaring trade. Chinese music drifts down the crowded street. Delighted children wave lighted toy dragons coiled around sticks. There must be thousands here strolling by in the carnival atmosphere, taking in the sights or munching on delicious barbecued pork slices and roasted chestnuts. Chinese New Year in Bangkok 2006 has something special. Four chefs from Guangzhou, China whip up a special 60-item menu at the Grand China Hotel to honor the 60 years of the King's reign. Every table in the hotel restaurant is taken. 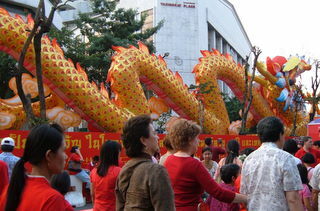 At dusk, the lanterns and dragons in Yaowarat light up. Back at the Odeon Circle, Chinese dragon and lion dancers take center stage, prancing to the incessant pounding of drums and clash of cymbals, watched over by a giant fiery dragon with eyes blazing in the night. 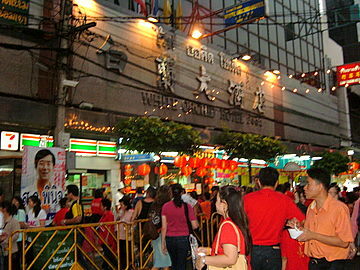 The celebrations for Chinese New Year in Bangkok 2006 continue. We have to call it a night. There's another night of festivities tomorrow. Have a Happy Year of the Dog. 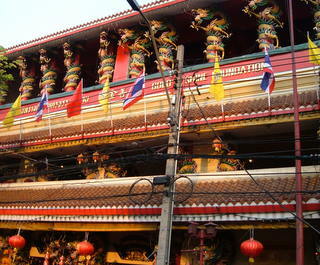 Find out more about Chinatown Bangkok.